Click the links below to enter each part directly. How to check the balance of ZMN available on the GPU Portal system. How to Deposit/Transfer ZMN into GPU Portal system. How to check transaction history. How to withdraw ZMN from GPU Portal system. How to create MasterQueue from ZMN available on GPU Portal system. MasterQueue available on GPU Portal system. Schedule for the next MasterQueue Reward. Token holders are able to check the available balance of ZMN on GPU Portal system by clicking on ‘BALANCE’ tab. 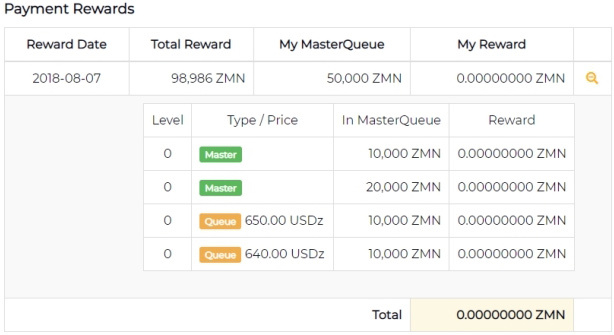 To check the available balance in GPU Portal, the system will display the total amount of ZMN token in the ‘Balance of Your Wallet’ Which is included all ZMN tokens that has been in MasterQueue and has not been in MasterQueue, as well as the USDz credit that has been converted from ZMN. 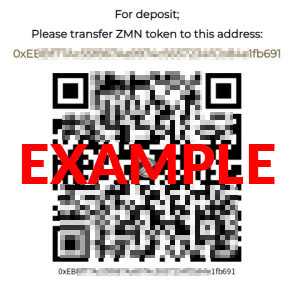 To transfer or deposit your ZMN token into GPU Portal system. You can deposit by using the wallet address or QR Code that has been provided as shown below. THIS IS EXAMPLE IMAGE, NOT YOUR DEPOSIT ADDRESS. PLEASE CHECK YOUR DEPOSIT ADDRESS IN YOUR BALANCE PAGE. User can check ZMN’s transaction history on GPU Portal system from the table that is shown below. If there is pending transaction, it will also shows in this section. 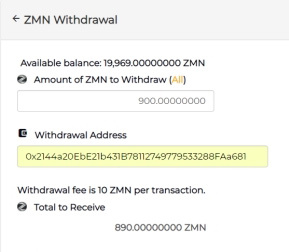 To withdraw ZMN tokens from GPU Portal, user can withdraw by filling up the amount that user wish to withdraw and add the address on Withdrawal Address section. The system will send a confirmation email to user email that has been registered. User have to confirm withdrawal by clicking the link attached in email. Once you confirmed, tokens will be transferred to the destination address within the specified time. After this step, the withdrawal can not be canceled. Transaction history will be show on this page. If you wish to cancel, you can make a cancellation in this section as well. Press ‘MasterQueue’ to enter the MasterQueue process. In order to create the MasterQueue from ZMN tokens available on GPU Portal. The minimum amount to create a queue is 10,000 ZMN. Master is a queue without setting prices, user are able to set unlimited queue in this section. Queue is a queue that user set the desire price in advance. For this section, user can be set up to no more than 100 queues. Press ‘Create MasterQueue Order’ to create a queue from the selected amount. After you pressed a cancellation button, the window will pop up and ask to fill up the number you want to remove from ZMN MasterQueue (canceled MasterQueue). 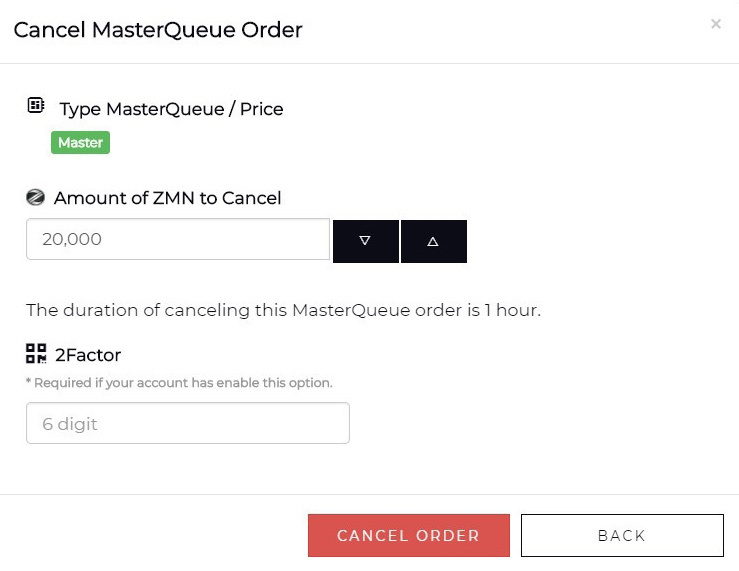 Press the CANCEL ORDER button to confirm the removal of the ZMN token from MasterQueue (Cancel MasterQueue) or Press to cancel the process. 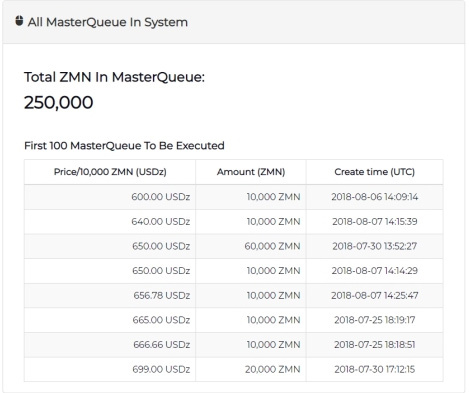 On this page, you will find the top 100 MasterQueue tables that are going to convert the coin at the set price, respectively, and show the total number of ZMNs in the MasterQueue system. If you would like to review your MasterQueue’s cancellation history (My Cancel Orders) and the conversion of your token (My Executed Orders). It can be found in the table at the bottom of this page. Press MQ Reward to enter the MasterQueue Reward section. 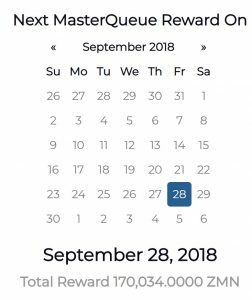 On this page, MasterQueue Reward will display the schedule for the next MasterQueue Reward and the amount that will be rewarded to users. MasterQueue’s user can review the history of the reward from previous round in this section. The system will display the history of the previous MasterQueue Reward received in each queue. MasterQueue’s user can review the history of the reward from previous round in this section. The system will display the history of the previous MasterQueue Reward received in each queue. On the lower part of this page. Users with MasterQueue can check the number of queues at each level of your MasterQueue by pressing the button in each level.